UNM CCC uses the brand and visual identity rolled out by main campus and health sciences. By following this brand and visual identity, we communicate our relationship to UNM and our commitment to health literacy, patient education and health-related research and academic communications. Download templates by filling out a template request form. The download information is displayed in the thank you screen of the form. You may also request other templates or needs within the form. Most business cards are ordered online through CG Printers. Please note there are Clinic and Appointment cards too. Purchasing is aware that CG Printers switched to Paypal for their online order processing. You will need to put in a special exemption request before the order as Paypal is a third party vendor. Most cards are under $25 for a box. If you will be ordering several times a year, estimate the cost and put in a blanket exception request for the year. Since printing is considered a service, there will be tax on the receipt. After logging in, there are (5) options for ordering cards. Use either #2 or #3 of the Health Sciences options. After selecting your specific card, you will input the name, title and other card information on the next page. Front of the Card: As you input your information, a business card proof will update in real time at the bottom of the page. 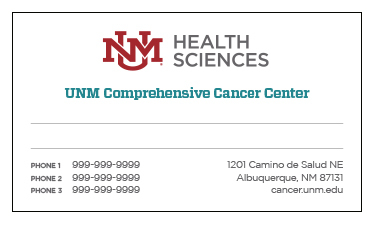 Back of the Card: On the Horizontal Business Cards, there is a pull down menu to select a logo for the back of the card — please select the UNM Comprehensive Cancer Center logo. Please proof your card very carefully. CG Printers is not responsible for any errors after submitting your order. 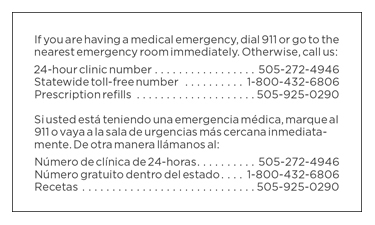 The clinic cards have a unique back side with additional numbers for emergencies and prescription refills. It also has information in Spanish. To order this card, use the UNM CCC Clinic Card Order Form and email it to service@cgprinters.com. This clinic card has two blank lines to write in appointments. The back side also has the additional numbers used on the clinic card above. To order, complete the appointment card form and email it to service@cgprinters.com. Quantity: 500 qty. or higher in increments of 250. A proof will be sent to you to approve your order. CG Printers will request payment before delivery. To retain logo quality and usage, you may be asked to attend a logo usage presentation before being sent UNM CCC logos. Click here to see upcoming training sessions. Request a logo here. Order giveaways, trophies and other items with logos through approved vendors. They have the new logos for use – simply note on your order to use the UNM Comprehensive Cancer Center logo from their Learfield partnership.